In the past year, I’ve had the chance to review two excellent and portable Bluetooth speakers. Both the UE Mobile Boombox and the Jawbone Mini Jambox Jawbone Mini Jambox Review and Giveaway Jawbone Mini Jambox Review and Giveaway The Mini Jambox is the latest and greatest in a line of Jawbone Bluetooth speakers, and as such, we had to take it for a spin and see what it’s all about. Read More have impressed me so much, I was almost tempted to keep them both, redundant as that may seem. So imagine my excitement when the chance cropped up to review what should be superior to them both — the Ultimate Ears Boom. This 360 degrees Bluetooth speaker promises 15 hours of straight listening, “bold, immersive sound” and a range of 15 meters (50 ft). It supports NFC, comes with a built-in alarm clock, and should even be waterproof enough for a day at the beach or pool. So how does this cylindrical speaker measure up to the competition? We took it for a spin to find out. And as you’ve probably guessed, one of you will be lucky enough to win this $200 speaker for free! Keep reading for more information. The $200 Logitech UE Boom, the older, better and larger sibling to the UE Mobile Boombox, is an 18 centimeters (7.1 inches) tall cylinder with a 6.5 centimeters (2.6 inches) diameter. It weighs over 500 grams (19 oz), which puts it at about double the weight of the smaller UE Mobile Boombox. At these dimensions, the UE Boom might not sound like the most portable speaker in the world, but Logitech made some interesting adjustments to the speaker to make it easy to carry around despite its larger size. As common in the Bluetooth speaker world, the UE Boom comes in six different color combinations. When it comes to size, the UE Boom’s closest competitor is the $250 Big Jambox by Jawbone. Just like the UE Boom, the Big Jambox promises 15 hours of continuous play. Unlike the UE Boom, it doesn’t support NFC, and offers a range of only 10 meters (33 feet). It’s also $50 more expensive, which makes the UE Boom a pretty good choice when it comes to pure specs and price. Jawbone speakers do offer some extra features which we already covered in our Mini Jambox review Jawbone Mini Jambox Review and Giveaway Jawbone Mini Jambox Review and Giveaway The Mini Jambox is the latest and greatest in a line of Jawbone Bluetooth speakers, and as such, we had to take it for a spin and see what it’s all about. Read More . There are several smaller competitors to the UE Boom such as the $200 Beats by Dr. Dre Pill and the UE Boom’s own sibling, the $80 Logitech UE Mobile Boombox. After unboxing a fair share of devices in the past year, the UE Boom’s packaging is still one of the most impressive I’ve seen. In fact, it feels more like unboxing a space instrument or some “serious” piece of equipment, and not much like a simple speaker. While the box itself is certainly beautiful, it doesn’t betray the magic within until you start the unwrapping. Out of the paper cylinder comes a plastic box; a box which at first glance looks completely unopenable. Turn it around for a minute, and you still might be baffled as to how this thing works. And then, just when you’re about to give up, you’ll notice a small sunken spot in the middle of the plastic. Without much hope, you’ll touch it, and the cylinder will suddenly pop open. This is all a very satisfying experience, but at this point you’ll start to wonder: is the speaker itself all I’m getting? How about a USB cable? A charger? Any accessory at all? This is where the UE Boom’s box surprises yet again. See those ordinary looking plastic wheels at each side of the speaker? They’re not as ordinary as they seem. Each of these holds some extra accessories for your new UE Boom — accessories which you may not find with other Bluetooth speakers on the market. Along with every UE Boom, you’ll get a flat micro-USB cable, a wall charger with US, European and UK adapters (all in bright yellow-green so you never forget what they belong to), a plastic cover for the micro-USB port and audio jack (for waterproofing), and some information booklets. Once you’re done being impressed with the packaging (this might take a few minutes), it’s time to take a look at the speaker itself. The UE Boom and UE Mobile Boombox have similar design lines, and yet the former manages to look like a completely different species than it’s younger sibling. The UE Boom can stand any which way you want. On its bottom, on its head, and even on its side. The cylindrical shape makes it sound equally good no matter how it’s positioned and which way it’s turned to. The huge plus and minus buttons are the speaker’s volume buttons, and while they’re certainly easy to see, they’re not that convenient to use. More likely than not, you’ll find yourself adjusting the volume using your connected device. On top, you’ll find the speaker’s power button and pairing button. Each comes with its own LED to signify low battery, and whether the speaker is in pairing mode or is already paired. On the bottom, reside the aforementioned micro-USB and audio jacks, and the UE Boom’s D-ring. You can use the D-ring to clip the speaker onto your backpack, your pants, or anything else you can think of. The D-ring comes off to reveal a tripod mount, which adds a whole new dimension to what you can do with the UE Boom. The D-ring is a bit hard to remove the first time — you may need to use a screwdriver or a fork handle to get your leverage — but once it’s removed once, you’ll have no problem removing it again. Unlike the Mini Jambox, the UE Boom is not a “smart” speaker. It doesn’t have different accents — in fact, it barely talks — and the main focus seems to be on the listening. Pairing the UE Boom for the first time is a breeze, and for any subsequent device, all you have to do is long-press the Bluetooth button to put the Boom in pairing mode. The speaker remembers up to 8 devices, so once you have these paired, the UE Boom will automatically pair again when it detects them. NFC pairing makes the whole thing even easier. At any point, you can press the volume up and down buttons at the same time to hear how much battery’s left in the speaker. The speaker comes 30% charged out of the box, and after almost 2 hours of non-stop listening and playing, it still claimed to have those 30%. The Bluetooth connection’s 15 meter range is definitely impressive, and it kept working no matter how far I got from it inside the house. It did start stuttering when I left the apartment and closed the door, though. Like most Bluetooth speakers, the UE Boom can also be used as a speaker phone. If a phone call comes in while it’s paired with your phone, the UE Boom will turn down the music and alert the call. Once you answer, the UE Boom is an excellent speaker with good sound quality for both sides. This continues to work well even if you leave the phone behind and carry just the speaker around, which is more than could be said for either the Mobile Boombox and the Jawbone Mini Jambox. When compared to the smaller UE Mobile Boombox, the UE Boom is superior in most aspects. The sound is distinctly better, which makes sense due to the UE Boom’s better specs and larger size. The quality of build feels about the same, but unlike the smaller Mobile Boombox, the UE Boom is safe to carry along to the beach or pool. The UE Boom’s auto-off feature is better the the Mobile Boombox’s, which, when left on, runs out of battery pretty quickly. The UE Boom’s shape also makes it much more suitable for watching movies or getting good sound for an entire big room. Two UE Booms paired together can be used for actual stereo, and could provide a good, affordable solution for your home entertainment. Despite being on the heavy side, the UE Boom is easy to hold in your hand and carry around. The mesh on the speaker itself feels like cloth of some kind, and the rest of the speaker is covered in durable rubberized material. All in all, the UE Boom feels very durable, and I wouldn’t hesitate taking it out of the house. As it is, the UE Boom doesn’t come with many features other than good sound. This changes when you install the UE Boom app (Android / iOS). The app is free, and the first impressive thing it did was recognize what color my speaker was. While it may show the red one to anyone who installs the app, the screenshots on iTunes and Google Play make me think differently. The app includes lots of information about the UE Boom, as well as the option to pair two UE Boom’s to the same device. In the settings, you can see and hear the speaker’s battery level and change the language of this alert to one of eight different languages. Through the EQ settings, you can adjust the speaker’s sound to best suit your environment. While the “Out Loud” option sounds great in most places, the “Intimate” setting for small rooms sounds much better indoors, and the “Vocals” setting is great for watching movies or listening to podcasts or talks. You may have noticed that both the Alarm and the Bass Boost options are greyed out in the screenshots above. That’s because they’re not available in the firmware version my speaker came with. In order to use these settings, it’s necessary to upgrade the speaker. Unlike the Mini Jambox, which upgrades solely using the Jawbone website, the UE Boom update requires that you download and install a updater (available for Windows or Mac OS X). Also unlike the Mini Jambox, the update is very quick once you’ve installed the software and plugged in your speaker. There’s also no need to create an account of any kind. Once updated, you get to boost your bass and also use the Alarm feature. Unfortunately, the latter isn’t as exciting as it sounds. The UE Boom’s alarm clock lets you set your speaker to start playing music when you want to wake up, or at any time you want to listen to music. Other than the time to go off, you can choose which song you’d like to listen to when you wake up. This can be exactly what you were listening to last, anything from your music library, and even playlists from Spotify or Pandora, if you have accounts. This all works great. Trouble started when the alarm actually went off. The music start off gradually, which is great for waking up, and looking at your phone at this point, you get two options: Snooze and Alarm off. If you choose to snooze, the music will turn itself up to full volume for a split second before turning off — enough to give you a heart attack while wide awake, let alone while half asleep. The music will stay off for 10 minutes — a setting I found no way to control. When it starts up again, it doesn’t always show you the alarm screen again, meaning you can’t really turn the alarm off or snooze again. In fact, when this happened to me, I had to stop the music using my music app, and was stuck with the alarm clock icon in my notification area. It kept saying “snoozing”, but I had no way to actually turn it off. This happened every time I tried snoozing the alarm. Should You Buy The UE Boom? The Logitech UE Boom is a serious Bluetooth speaker, and is meant for serious music listeners who want to keep listening on the go. If you like your music absolutely everywhere, want to use your speaker in parties, at the pool or beach, or to watch movies, the UE Boom is an excellent buy. It’s portable enough to go anywhere with you, and you can rest assured it won’t be easily damaged. The sound quality you get from it is great for its size, and the 360 degrees effect really does fill the room. Here, again, we come to the question of price versus needs. While the UE Mobile Boombox cannot compete with the UE Boom when it comes to sound, it’s $80 price tag is tempting. It’s smaller, lighter, and more mobile, and the sound it produces is great for most purposes. If you’re looking for excellent battery life, long range, and booming, customizable sound in an extra durable speaker, the UE Boom is worth the investment. If your needs can be met by a smaller speaker with decent sound and shorter battery life, you’ll be very happy with the Mobile Boombox as well. MakeUseOf recommends: Buy it, If you’re looking for a mid- to high-end Bluetooth speaker for a decent price. How do I win the Logitech UE Boom? This giveaway begins now and ends Friday, December 20. The winner will be selected at random and informed via email. Congratulations, George Guba! You would have received an email from jackson@makeuseof.com. Please respond before January 15 to claim your prize. Enquires beyond this date will not be entertained. You misspelled centimeters. It's spelled centimetres. Metre is a distance unit, meter is used as in "parking meter." Why, I'd pick the Logitech UE Boom of course! Most likely I would choose the Logitech UE Boom. Great with NFC definitely UE boom! this is a good for my phone! definitely Logitech UE Boom! Logitech UE Boom without a doubt! If I were looking for a rugged, waterproof Bluetooth speaker, I would choose the Logitech UE Boom. Wait! ... for how much?!!... never mind.!! The Logitech Ultimate Ears Boom seems to be a good choice, right now. Probably this one, since it's the only one I've read about, and it sounds great. The Logitech UE Boom seems to be a good choice. I would pick Logitech UE Boom. Probably the UE Boom as it's the only waterproof Bluetooth speaker I know of. The Logitech UE Boom, of course. I will need to choose the Ultimate Ears Boom to try them out! The only way I would be in the market is when its a lot cheaper . The $80 Logitech UE Mobile Boombox would still be too much. do i really need one like that? I would choose Logitech UE Boom! Logitech UE Mobile Boombox because if I was looking, I'd be cheap about it. This one, I guess... I haven't researched into bluetooth spekers yet, but the Logitech UE Boom seems at least decent if not great to me. Logitech UE Boom - most definitely. I would definitely buy this bluetooth speaker for myself OR as a gift. Very reasonably priced (only $179.99 at Amazon) and, after reading this review, I am convinced this would be the speaker for me. UE Boom - didn't know of anything as resistant as this seems to be, and waterproof to boot. Perfect for the next trip to the beach. The UE Boom from Logitech will work great with my tabilet. The Logitech UE Boom would be my only choice! sound like this Logitech UE Boom is great! I've always been happy with all my Logitech products! Sounds like a good product, compared to Beats Pill, would certainly buy it. I would use the UE Boom! Logitech UE Boom - certainly. I don't know yet, I havn;t seen much rugged bluetooth speakers. I'd go for the Boom, for sure! It has great reviews! I would literally cry if i won this. Give it to me please. Logitech is atop flight company.I use a Logitech wi-fi mouse and keyboard,and love them! Really makes a nioce addition to my laptop-dont have to be right on top of it(they work up to 30 ft.). So tho I've never tried these speakers,I have no doubt they'll be in keeping with the Logitech quality.Whoever wins-hopefully me,but I never win anything-will surely enjoy it. Would love to win the Logitech UE Boom! After reading the review it might be this one! As for ruggedness look, I really like Braven BRV-1 waterproof bluetooth speakers. But Logitech is indeed a trusted brand, I wouldn't mind trading my Braven speakers for this one. Thanks for the chance. Logitech is a trusted brand and quality. The Braven 855s is a serious speaker, but unfortunately it also comes with a serious price tag. Just bought one from the Apple shop - now just need this one for stereo! 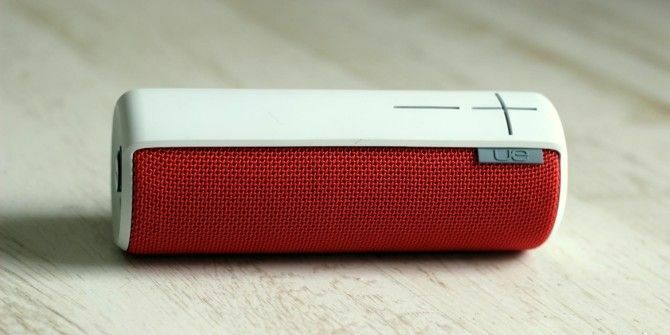 I think the Logitech UE Boom looks like a fine choice for a BT speaker. Actually this model sounds great, and I already trust Logitech products. Logitech UE Boom, of course. Logitech is the highly trusted and high quality brand here! CHEERS!! This one looks very promising so i'll choose this. Logitech UE Boom of course. Logitech is a trusted brand and quality. UE BOOM, I choose you! I'll choose whichever delivers the best stereo. Anything else is a step back to the old transistor radios...and I'm not really keen on the Retro since I lived through it all the first time. I'd choose this bad boy. Looks nice and from the review, sounds like the sound would be more than satisfactory to me. the device would benefit having more watts of power. Logitech UE Boom please, thank you. I would pick the UE Boom as a good waterproof speaker. Logitech UE Booms seems to be a good choice. UE Boom sounds like the right choice. The UE seems like a good investment. No clue which one I'd pick but this one definitely makes the shortlist! Wanna use it first hand before having a sincere idea about it. I have a bluetooth speaker request on my Santa list. The Logitech UE Boom would definitely be a great product to have. I like this gadget as a waterproof addition to my sound environment! I have no clue what to choose. Not that familiar with any of them. Sure I would have to do some extensive research. I'm now using several Logitech products, so yes, the UE Boom sounds great! Of course I would pick the Logitech UE Boom, it would be awesome to win it! The Logitech UE Boom, of course! No idea about any speakers. UE Boom will be my choice. I would choose the Logitech UE Boom. From this review, I'd say the UE Boom is the device to get! I'm guessing the Ultimate Ears Boom! Logitech UE Boom for portability love Logitech had there PC Speakers for years now & still going strong, so the Boom for my laptop. Logitech UE Boom the best on the market!! UE Boom - change all the setting with the app!!! I need a sturdy bt speaker! The 20th is my birthday. Thus would be a great gift to receive. Hint, hint. The Logitech UE Boom sounds great to me! I'd pick the first one that shows up on my doorstep every time. Definitely the UE Boom. A lot of positive Amazon reviews and The Wirecutter convinced me that this is the rugged speaker to get. Logitech UE Boom for sure! I would have to say the UE Boom. I would love to use the Logitech UE Boom in my car, which is not Bluetooth enabled and has no input jack to the radio. Now I listen to my sudiobooks with earphones while driving. This one, as it is small and portable. This one, especially if it's free. I haven't decided yet, but I will go for the UE Boom if I have the chance. I'm not sure yet, as I've never owned one. I've been looking at the UE Boom, which lead me to this page, but have also looked at the Jambox. I haven't searched for other speakers, so I'd go for the one I know: the Logitech UE Boom. I didn't know of any rugged, waterproof bluetooth speakers before this article, so I would pick the UE Boom. I don't know any rugged and waterproof speakers except this UE Boom, love it for design, NFC connectivity & long battery life. But the extra features seems not impressive, the Mini Jambox, I think, it's better. This is currently in my Amazon Wish List, hopefully I don't have to buy it! I have looked a few of the bluetooth speakers and some sound great while many seem to lack good sound quality. I would want to get something that has good sound quality over good looks or possibly portability. This would be perfect. I make travel presentations to seniors every month and my speaker failed to work last week. I've never actually had a bluetooth speaker. The UE Boom does seem to for what I'd be looking for though. UE boom for Bluetooth Speakers but for Earphones, Jaybird Bluebuds X.!!! Wouldn't have been my first choice, but once I heard about this one, I would defiantly choose this one! This is the best! UE Boom. Sounds like a winner after I read the Amazon Reviews. I don't even know waterproof speaker exists. Logitech UE Boom it is! I would choose the UE Boom speaker. its just amazing.. The UE boom looks like a winner. logitech UE boom! seems to be pretty good! all my peripherals are Logitech... maybe here to!? Bose would be nice then! Ultimate Ears Boom, since nothing comes to mind. Ultimate Ears Boom seems a good choice! I had no knowledge about waterproof Bluetooth speakers before I read this review to be honest. So i would definitely choose this one. It looks superior in terms of build quality too. Also has NFC which I can ' make use of ' with my smartphone. Seeing as I don't know of any other waterproof bluetooth speakers, the UE is my choice by default! The UE Boom because I don't know of another portable speaker that's waterproof. this one, because it's the only one I know about. UE Boom would be great! This would be so much better than the cheap one I got at Ross!! The Ultimate Ears Boom is amazing. Great article! I will love to have one! I'll go with this device it looks cool. I would pick the cheapest. The Ultimate Ears Boom. Every other bluetooth speaker I knowsince I don't doesn't offer waterproofing. Don't know, but probably this one. I'd most likely get this one. Kinda pricey, but sounds good, according to these guys. I would love to pick the Ultimate Ears Boom for sure. This one looks good to me! This one looks nice, even better if it comes free! I would pick the Ultimate Ears Boom. Dont know if this is a popular category. But I would chose this one since reviews are good especially on amazon. I really didn't know there was that many to choose from? That's a pretty specific category. So, this one, I guess. No other than UE BOOM ! Its gonna be my Christmas present! I'm a fan f the Jamboxes, but these ones definitely have the "rugged" angle covered. I have the Jawbone mini and love it. But, the UE Boom wasn't out when I got it. From what I've read, the UE Boom would be the way to go. UE Boom is definitely the speaker I would pick. Love the features. This one looks like a good speaker. Wow! The UE boom sounds amazing. I was looking at some BT speakers on black friday (Staples) but nothing in stock impressed me / maybe it was just the setup/ didn't see this one there or I would have bought it. I'd pick the UE Boom, because it seems to have a good set of features. The Logitech UE Boom of course. I've own a wide range of branded speakers but only Logitech lasts, so this maybe the next speaker I will want to own.